Datchet Autumn Series, 23rd November…!! No doubt having looked at the weather forecast and hearing the heavy rain falling on Sunday morning, the more sensible sailors of the fleet decided to stay in bed. However 4 crews did rock up and race in what turned out to be an increasing, if cold, wind. Along with the usual autumn series crews of 3954 (John and Helen) and 3427 (Mike and Ian), Roger and Richard put in an appearance in 3642 as well as Stephen and Nigel in 3703. After a postponement to allow marks to be moved and boats to make it to the other end of the water, the fleet got underway and it soon turned out to be effectively a match race between Stephen and John, with Roger trying to overhaul Mike after being a little late to the start. Stephen and Nigel got to the windward mark just ahead of John and Helen, only to round and not hoist their kite. John and Helen launched straight away and managed to gain ground back on the first tight reach. At the gybe mark, John was just behind but on the inside and through the next light and shifty leg managed to creep over Stephen to take the lead at the leeward mark. At this point they appeared to shift up a gear and slowly increase their lead all the way to the finish. Mike held onto third position and Roger was fourth. 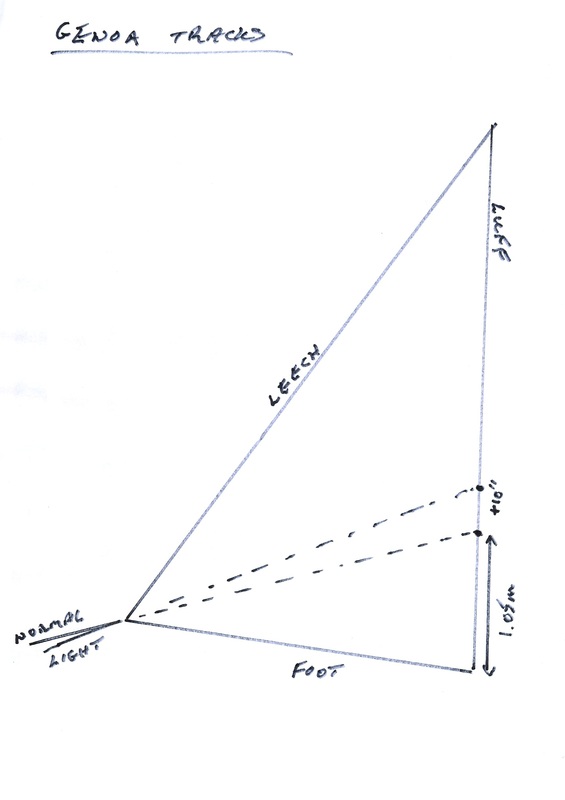 Although the breeze was increasing, it was by no means steady and there constant shifts and veins of breeze meaning the first beat of the second race was an interesting affair with John Stephen and Mike swapping places on a number of occasions with Stephen eventually getting to the windward mark first followed by John, Mike and then Roger. Stephen and John started to pull away from Mike and Roger meaning 2 distinct races were in progress for the rest of the course. Eventually John overhauled Stephen, and Mike managed to keep ahead of Roger, meaning the result was exactly as it was for the first race. With only a few races left in the series, John (3954) has a commanding lead, followed by Richard (4011) and then Mervyn (3536). 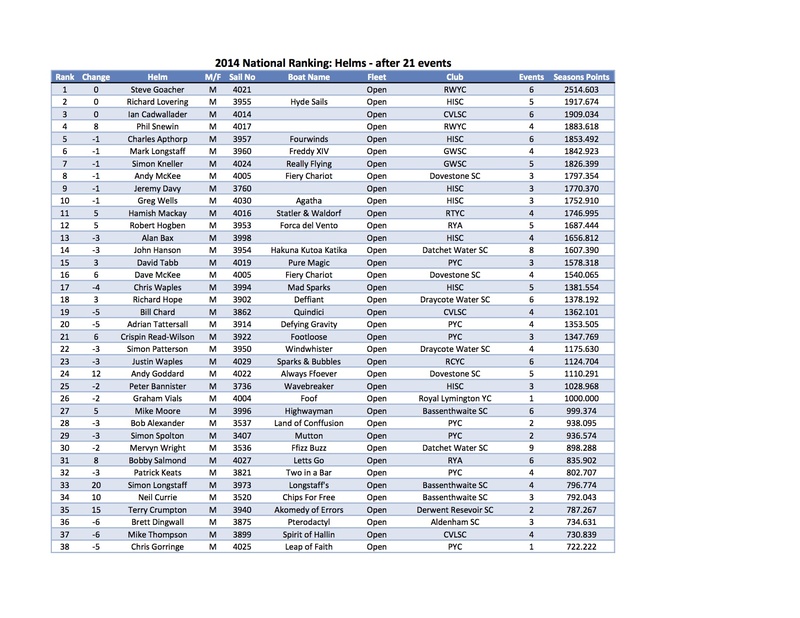 National Rankings – 2014 Round Up……!! 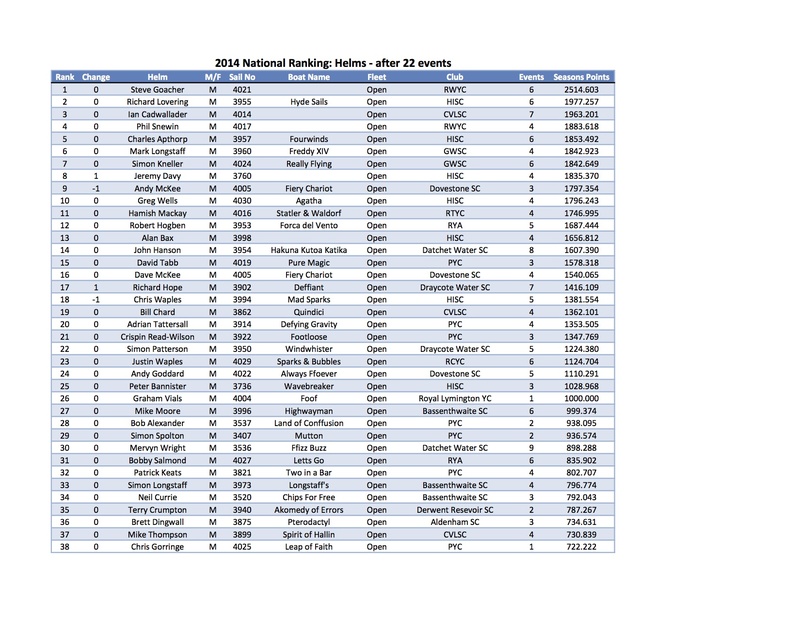 This is the final report from Tom Waples on the National Rankings analysis. It’s the overall summary of our season. To me, at least, the most obviously striking thing is the breadth that the Class has have this year. This is true on venues, winners, fleet sizes, boat ages etc. Pretty good too has been the strength of the “Top 5”, that is to say the FF Association Championship programme. 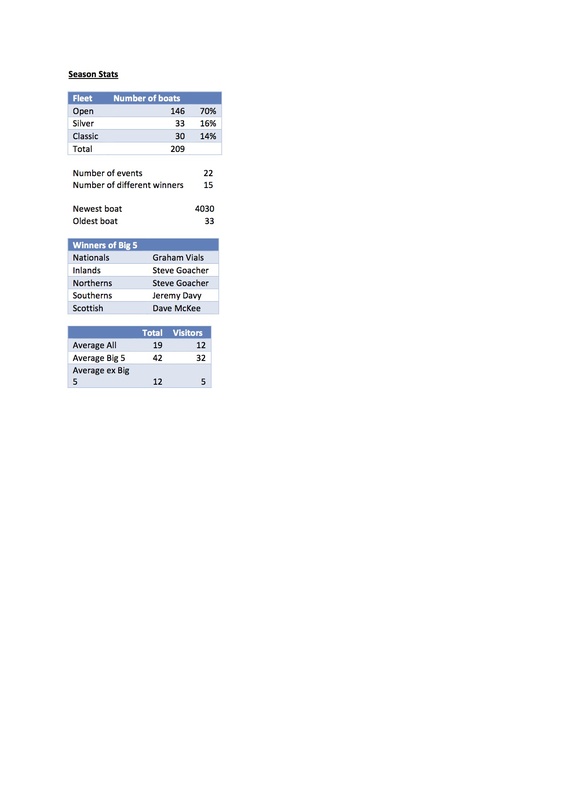 Take a look and see what you think…. Rankings – PYC and HISC Lead The “Top Clubs” List…..!! In the third analysis that Tom Waples has extracted from the 2014 Rankings, we have results by Club. It’s pretty interesting reading. 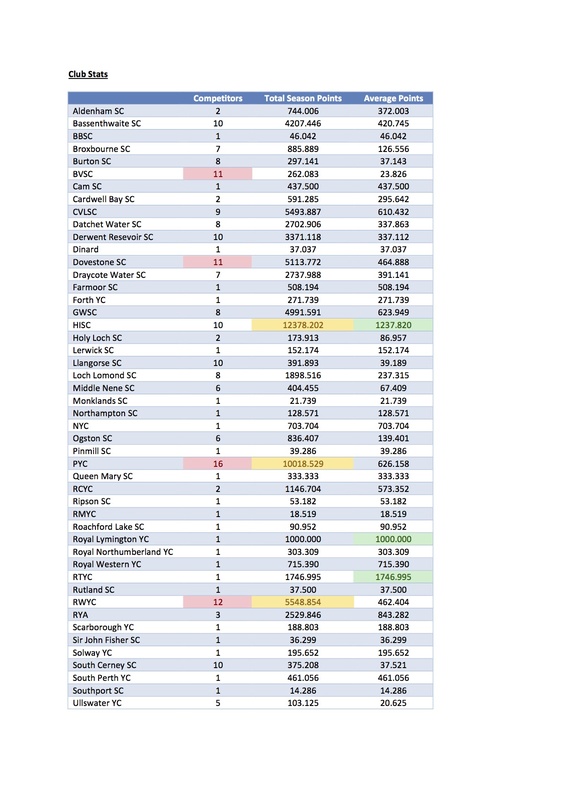 For sure I thought it would be all about HISC, but arguably our Top Club on some ratings is Parkstone. PYC tops the table for number of competitors in the Rankings (16 boats) and is second to HISC in the points table!! There’s a long list of teams participating in the National Rankings – around four dozen. Of course, we should peel back the number of Clubs with just one or two teams competing, but that still leaves us with 20 strong or very strong Club Fleets represented on the circuit. A pretty strong performance for any Class this decade. 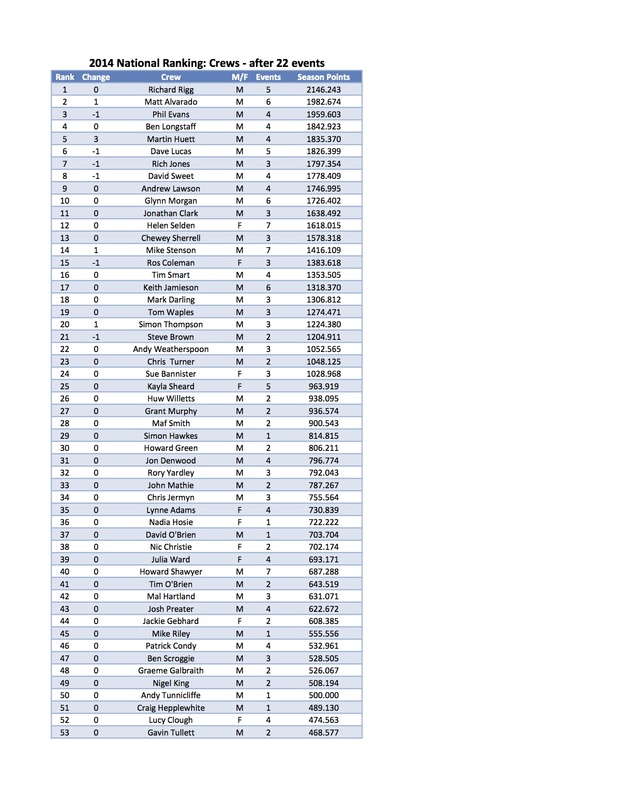 2014 Rankings – Deep Dive 2 – Crews ….!! You will remember from a couple of days ago that Tom Waples has started giving us his extra Rankings Analysis on the 2014 season. Today we get to see what Tom has discovered in terms of Crew Rankings. First up – we learn celebrity crews move around! The names are not necessarily associated with the helms name these days – and King of this Mountain is Richard Rigg ! The other piece I see is that our most travelled crews are Helen Selden and Howard Shawyer, both from Datchet and both with 7 events each! Datchet Autumn Series Update ….!! Having had 9 crews out the previous Sunday, 7 crews braved the lashing rain to rig for this Sunday’s racing, including 2 newcomers using Mervyn Wright’s boat 3536 as he was the Race Officer for the day. After a slightly delayed start whilst the Race Officers organised the racing areas for both the club sailing and the Cat End of Season races, the first race got underway on a long starboard-rounding course. Sadly, 3954 (John Hanson and Helen Selden) were so keen to get underway they were a little early for the start and had to go back, ending up getting over the start second from last. 4011 (Richard Jones and Howard Shawyer) and 3888 (mike Firth and Phil Tinsley) led most of the fleet out left whilst 3954 slowly reeled them in playing the shifts up the middle of the course, so that they were 2nd going around the top mark with 3888 leading and 4011 in 3rd. Despite their best efforts 4011 couldn’t overtake 3954 over the next two reaches and so the order remained the same going into the second lap. At this point 3954 seemed to find an extra gear and managed to overtake 3888 on the beat and extend their lead for the rest of the race, taking the gun. 3888 tried valiantly to retain second but on the last gybe mark, 4011 overtook them to take 2nd. 3427 (Mike Clapp and Ian Klyne) came in fourth, followed by 3521 (Trevor Brant and John Watling), 3536 and 3562. Unfortunately, Phil Tinsley (in 3888) couldn’t carry on for the second race due to a bad back, and so the fleet was now 6 for the second race. Our star guests, Alastair and Ben from Australia, were trying out the Flying Fifteen loan program – and helm and crew in 3536 swapped over for this race whilst FF Fleet Captain, Mervyn Wright,shortened the first beat before setting the fleet off. Again, ever eager to get racing, 3954 (Hanson and Selden) were over the line at the start with 3536 and so both had to go back and try again. In this time 4011 took a commanding lead, but were eventually overhauled by 3954 on the third beat. 3427 did very well taking third over the line and 3536 managed 4th in this race. Due to a large RS End of Season event at Datchet this coming weekend, there will be no club racing, so the fleet will be re-convening on 16th November for the next round in the autumn series. Ovington Inlands – Your Last 2014 Chance to Race Against our Double Worlds Heroes…!! Your last chance to test yourselves this year against Graham Vials and Chris Turner is coming up!! The Ovington Inlands are taking place at Grafham on November 8th/9th…. 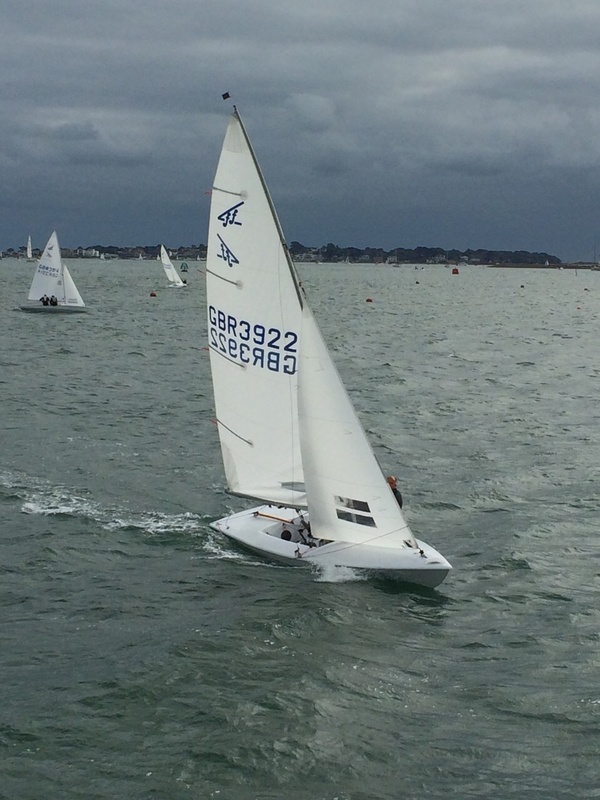 Parkstone Winter Series – Race 4….!! Saturday the 25th of October saw 22 boats on the start line for 2 races. 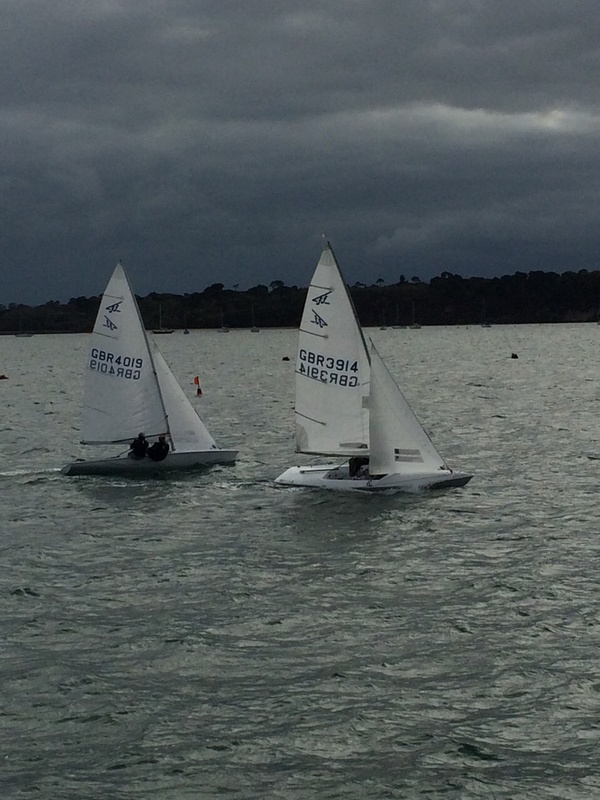 The first race was race 4 of the Parkstone winter series. A great course was set by the Osman family with a good beat followed by 3 nice reaches which resulted in planing in the gusts. Two rounds were sailed. The race started in a Westerly force 4 with the wind oscillating through 15 degrees and a changing tide. The first beat saw both sides of the fleet looking good at different times. At the first mark Crispin Read Wilson and Steve Brown were in the lead and managed to hold this to the end and held off a charging David Tabb and Chewey Sherrell. Graham and Ben Scroggie were third after pulling off a daring mark rounding on the reach to reach mark and stealing at least 6 places. The second race was a part of the short mini series which is raced on every other weekend. The Osman’s set a good windward leeward course for this. The tide had also changed so inevitably the class saw a general recall. 4 boats were over the line and this resulted in some silence at the finishing line. The race was won convincingly by Bob Alexander and Huw Willetts, 2nd were Chris Gorringe and Nadia Hosie with Adrian Tattersall and Andy Murphy in 3rd. It was good to see the last 4 boats in each race only separated by a few seconds showing the close racing all the way through the fleet. We also welcomed back Peter and Jo Allum after Petes leg operation. However it wasn’t so nice for past Commodore Barry Rolf as we looked back to see Pete on Port colliding with Barry who nearly capsized. I’m told the Barry actually got one foot on the keel. All fun and capers here at Parkstone. Pictures are by Jo Osman. Fantastic Video from the Draycote Sprint…..!! National Rankings – Final Event ….!! Another great Flying 15 season comes to a close at Draycote Water for the traditional and popular sprint event. 12 teams enjoyed close, tight racing in the 7 races. So after 9 months and 22 events, spanning the England and Scotland the class has two new Champions! 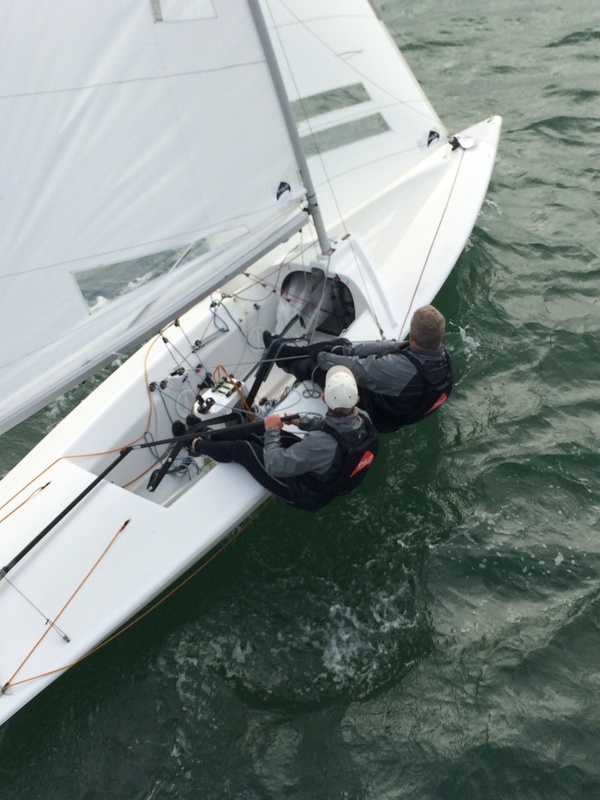 Steve Goacher takes the Helms title and Richard Rigg, the Crews title…both sailors of Royal Windermere Yacht Club! The 2014 Flying Fifteen Season Finale took place on Saturday 18th October and what a finale it was! Competitors for the Draycote Sprint Open sponsored by Mercure Brandon Hall Hotel and Spa, were greeted with excellent sailing conditions especially for October! 18 degrees, sunshine and force 4 to 6 south westerly winds, marvellous! Competitors included 5 of the Top 10 from UK NationalsOne of the home teams was Iain Christie & Simon Roberts in GBR797, its first outing in winds over ten knots since its fantastic restoration by Iain. With an undetermined number of races to be sailed and with each race to last around 30 minutes, Richard Pye (Principle Race Officer) and his team commenced the racing on schedule at Midday and set an excellent windward/leeward course, with a leeward gate. This led to some close and exciting finishes with places being won and lost on the line. The first race saw a clean start and with the fleet keeping close together, Greg Wells & Richard Rigg popped out in front to lead round the first mark only then to forget about the hitch mark. By the time they realised and went back, they were at the back of the fleet. This left three boats to battle it out over the next three laps, Richard Lovering & Matt Alvarado, Ian Cadwallader & Nick Stone and the home team of Jeremy Davy & Martin Huett. After a close finish Richard & Matt crossed the line first followed by Jeremy & Martin from Ian & Nick. The rest of the fleet closely followed with the exception of Iain & Simon who got into trouble after jibing and thus filled the boat with water. As we all know classic boats are not good at removing water quickly. After much bailing, they finally got ashore. Unfortunately they missed the next race but did manage to start the third race only for the main halyard to break. Race two quickly followed with Richard & Matt repeating the result of the first race this time followed home by Greg & Richard making amends for their seventh place in the first race, with Jeremy & Martin in third. A twenty minute on the water break was then taken to allow the competitors to recover mentally as well as physically! It felt more like five! Race three saw the emergence of the home boats, and after the first beat three had broken away from the main fleet, Jeremy & Martin in front followed by Simon Patterson & Simon Thompson with Kevin Holliday & Richard Glen in third. 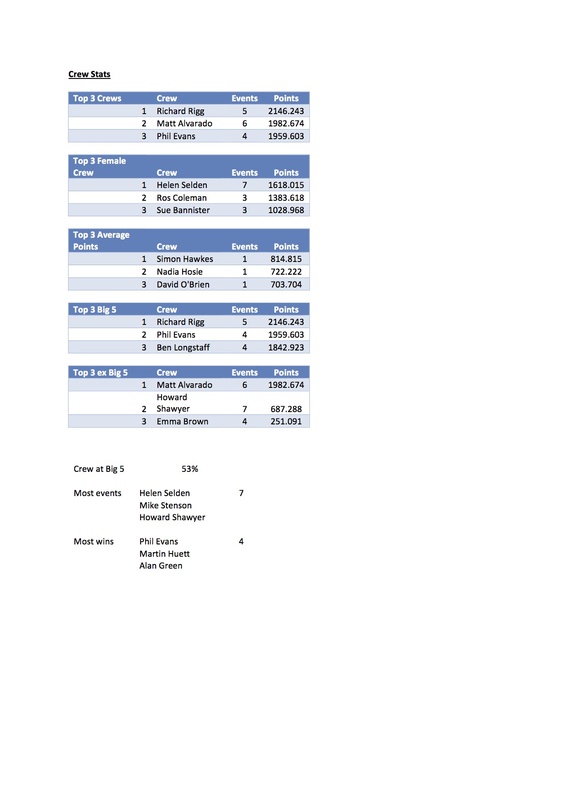 And this is how they finished with both Simon & Simon and Kevin & Richard recording their best result of the event. Race 4was a repeat of Race 1 with Richard & Matt, Ian & Nick and Jeremy & Martin battling it out at the front, however the final result was completely different with Jeremy & Martin in first, Ian & Nick in second and Richard & Matt in third. Race 5 and another clean start but for once Jeremy & Martin had a poor first beat which they never managed to recover from and recorded their worst finish so far being fourth. Meanwhile, Greg & Richard joined Richard & Matt and Ian & Nick up front but only could manage third with Ian & Nick taking their first victory. By now, tiredness was starting to set in both mentally and physically but luckily the wind was starting to ease.Only eight teams stayed out to compete in what they hoped would be the final race but it was the usual suspects up front which Jeremy & Martin recording their third win, followed by Richard & Matt and Ian & Nick. Once all the fleet had finished, the PRO decided there was plenty of time to hold one more race. So, after six thirty minute races, Jeremy & Martin led Richard & Matt by just one point. Not that anyone had any idea what the scores were by that stage! Race 7 and another clean start (making six out of seven and even then only one team was over the line) which again saw the top three teams overall battling it out all the way up the first beat this timed joined by Richard Hope & Mike Stenson. Unfortunately Richard & Mike could not match the pace of the front three and at 5.00pm finished in fourth, one place ahead of Simon and Simon who ended up finishing fourth overall. Finishing just in front of Richard & Mike in third was Ian and Nick to take third overall. This left Jeremy & Martin and Richard & Matt to fight it out at the front with the winner takes all. In the end, after five hours of racing, Jeremy & Martin prevailed thus defending their title winning the Gifford Trophy, leaving Richard & Matt in second overall. Despite recording two retirements and five did not starts, Iain & Simon won the Full Frontal Trophy and the FFalcon Cup, much to their surprise! So congratulations to Jeremy and Martin. Our thanks go to Mike Stenson and Mercure Hotels for sponsoring the event and providing some of the best prizes on the circuit. Thanks also go to Richard Pye and the Miracle fleet for running this fantastic event. We look forward to hosting the event next year and welcoming more visitors to take part in this unique event on the open meeting calendar. Results Flash from the Draycote Sprint….!! Seven races at the Sprint this year !! Report to follow. Southern Travellers Final Review 2014….!! Over the four events of the series held at Llangorse, Broxbourne, South Cerney, and Middle Nene there were a total of 40 teams competing from 9 Clubs with 7 qualifiers for the overall results. The Classic Fleet with 21 entries and 5 qualifiers had the strongest support with 2700 Neil Bartholomey and Emma Brown (Middle Nene) having a battle at the top with 2606 Bob Tait and Mick Musgrove (Broxbourne) which was decided on the last race at the final event, where 3031 Brian Turner and Jackie Burns (Broxbourne) also secured 3rd. All of the top boats sailed in at least 3 of the 4 events, giving themselves the advantage of a discard in the final results. The Silver Fleet attracted 11 entries (2 up on last year) with 2 qualifiers, 3341 Mike Firth and Phil Tinsley (Datchet) bettering last year’s winners 3374 Tony Oatley and Tim Greaves (South Cerney). The Open Fleet had 8 entries from 4 Clubs but none of the teams qualified for the overall results. Perhaps in contrast to reports from some of the other F15 events general rule observance and courtesy on the water was never an issue, which made for very satisfying and fair sailing. Everyone who sailed in the Series was full of praise for the organisation, enthusiasm and hospitality shown by the Host Clubs – the evening Dinner and social afterwards at Middle Nene was once again the bench mark for future years! Plans are already being made for next year – any suggestions or recommendations on how to improve the series and get even more travellers “hooked on” to take part in STS 2015 are always welcome. Finally, many thanks to all those who took part this year, both on the water either in the Race Management Teams or as Competitors and on shore as essential support for the whole STS Series, without you we wouldn’t have a Southern Traveller Series! 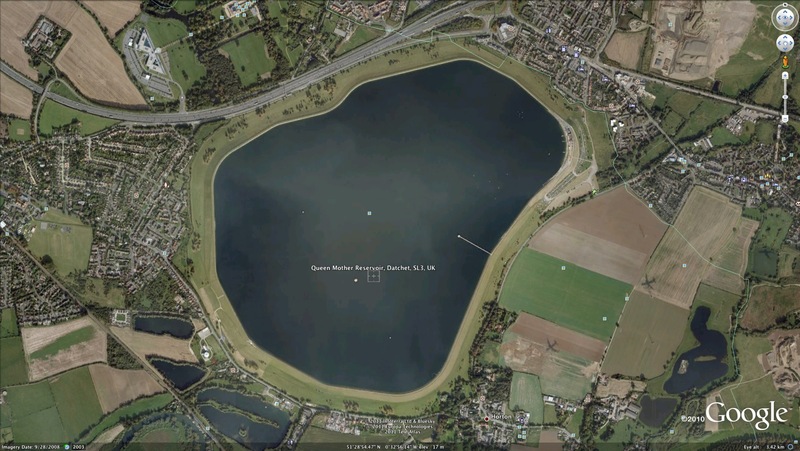 Season Finale – Draycote Sprint Coming Up…!! 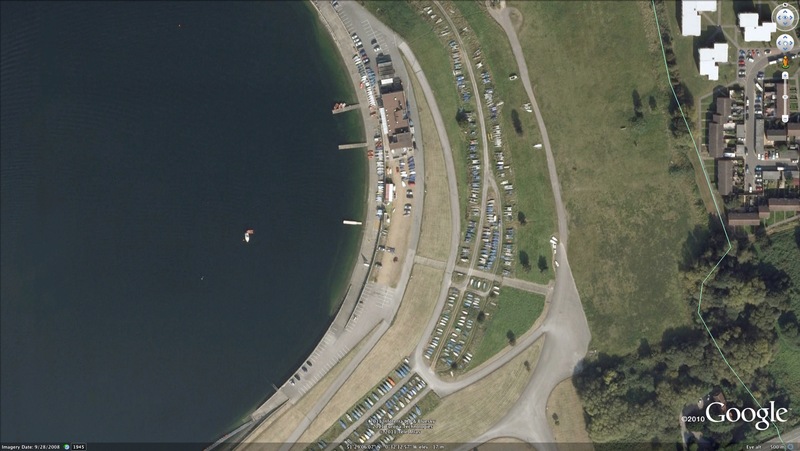 This Saturday (18th October 2014) Draycote Water Sailing Club will host the Flying Fifteen “Sprint” – the grand finale to the 2014 Flying Fifteen season! Richard Lovering and Matt Alverado (2013 top-ranked FF team). The Sprint is the last opportunity for FF sailors to earn 2014 National Ranking points and, with everything still to play for in each of the ranking categories, the event should prove to be an exciting climax to a fantastic FF season. As the fleet prepares for the 2015 World Championships in France, turnouts at FF events are on the up and the 2014 Sprint is expected to be the biggest yet! The Sprint will again be sponsored by Mercure Hotels. National Rankings – Round 21….!! Following on from a great third place at the Europeans in September McKee and Weatherspoon carried on their rich vein of form to comfortably take the Scottish Championship at Loch Lomond. 46 boats turned out for the last ‘big’ event of the season and enjoyed some great sailing. 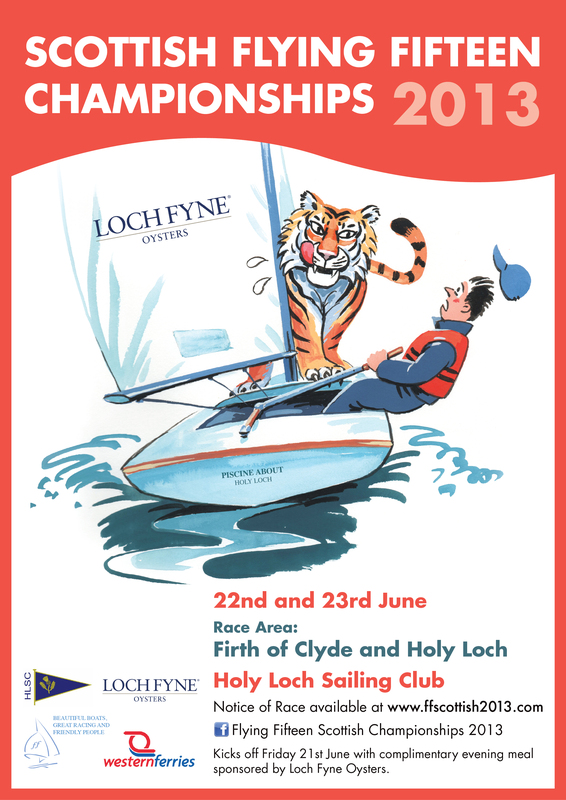 This continues the impressive turnouts seen this season and bodes well for the Nationals next year at Royal Northern & Clyde Yacht Club. 11 boats travelled to Middle Nene for the final event of the Southern Traveller Series which was won by Neil Bartholomey and Emma Brown. This solidifies their hold at the top of the Classic ranking. Once again the season concludes with the Draycote Sprint next weekend.